One of the most popular kitchen images on houzz.com, a leading destination site for home design enthusiasts, is an image of a kitchen pantry, with spices, taco sauce, olive oil, parmesan cheese, corn starch and even a lowly bottle of Pepto Bismol! 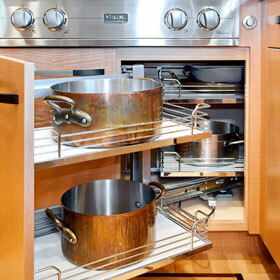 This also happens to be what you would find behind closed doors of a typical Bay Area kitchen remodel built by the Wm. H. Fry Construction Company. Based on feedback from many of our clients, they are particularly smitten by kitchen storage and accessibility hardware by Hafele America Co. Hafele kitchen hardware products offer a myriad of pantry storage solutions that are likely to make you want to show off your pantry too! 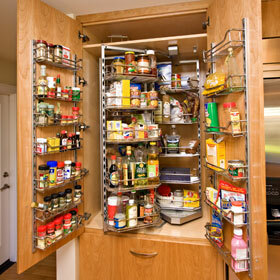 Hafele offers other great solutions to common storage problems, such as the vexing corner cabinet problem. One is the Lazy Susan, which I wish had a less pejorative name although revolving shelf unit sounds rather bland. Another is the Hafele Magic Corner shown below. According to the Hafele company website, this intelligent kitchen organization product “combines a sturdy shelf base with an exclusive finished metal railing. Aside from their stunning good looks these cleverly designed storage accessories are smart too.” So whether you’re planning an entire kitchen remodel or a minor retrofit, also plan on what’s behind closed doors!